NEW YORK, New York, February 15, 2012 (ENS) – Bangladesh has established three new wildlife sanctuaries for endangered freshwater dolphins in the world’s largest mangrove ecosystem, the Sundarbans. Officially declared on January 29, the sanctuaries are intended to protect the last two remaining species of freshwater dolphins in Asia – the Ganges River dolphin, Platanista gangetica gangetica, and the Irrawaddy dolphin, Orcaella brevirostris. While there is no global population estimate for either species, both have disappeared from major portions of their range but still survive in the Sundarbans. 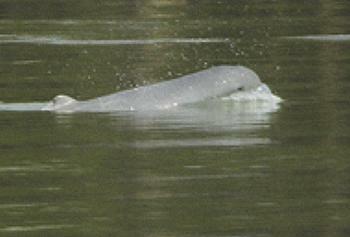 Rough estimates indicate populations of about 225 Ganges River dolphins and 450 Irrawaddy dolphins there. The IUCN Red List of Threatened Species lists the Ganges River dolphin as Endangered and the Irrawaddy dolphin as Vulnerable to extinction. Freshwater dolphins are among the most threatened animals on Earth because human activities, such as dam construction, toxic contamination and unsustainable fisheries, disturb their habitat. Population surveys find Ganges River and Irrawaddy dolphins living in the very waterways where human activities are most intense. The three sanctuaries – in the Dhangmari, Chandpai and Dudhmukhi areas of the Eastern Sundarbans mangrove forest – safeguard 19.4 miles (31.4 km) of watery channels with a total area of 4.1 square miles (10.7 sq km). The newly-protected areas were identified as dolphin hotspots by the Bangladesh Cetacean Diversity Project, a project of the Bronx Zoo-based Wildlife Conservation Society. These small areas could be the safety net that prevents extinction for these species, says the WCS, in view of the recent extinction of another freshwater dolphin – China’s Yangtze River dolphin whose last confirmed sighting was in 2002. Fatal entanglement in nets and habitat degradation killed off this species after it had survived in the Yangtze River for more than 10 million years. To mark International Freshwater Dolphin Day last October 24, the Bangladesh Forest Department approved the boundaries for the three new sanctuaries and forwarded the notification document to the Ministry of Environment and Forests for final approval. All three sanctuaries are based on recommendations from the Wildlife Conservation Society’s Bangladesh Cetacean Diversity Project, which has been working on freshwater dolphin conservation in the Sundarbans since 2002. “Declaration of these Wildlife Sanctuaries is an essential first step in protecting Ganges River and Irrawaddy dolphins in Bangladesh,” said Brian D. Smith, director of the WCS’s Asian Freshwater and Coastal Cetacean Program, a scientist who has been studying cetaceans in Bangladesh since the early 1990s. Smith’s research conducted with the Bangladesh Forest Department and published in the journal “Oryx” in 2010, helped to determine the locations and sizes of the sanctuaries in the Sundarbans. 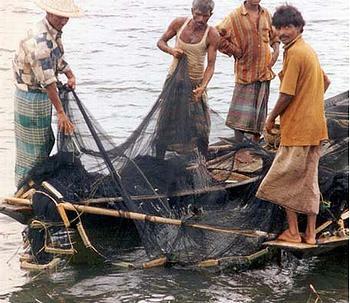 The Bangladesh dolphins are threatened by fatal entanglements in fishing gear and depletion of their prey from the by-catch of fish and crustaceans in fine-mesh “mosquito” nets used to catch fry for shrimp farming. The surviving dolphins are at risk from increasing salinity and sedimentation of the rivers caused by sea-level rise and changes in the availability of upstream freshwater flow. “As biological indicators of ecosystem-level impacts, freshwater dolphins can inform adaptive human-wildlife management to cope with climate change, suggesting a broader potential for conservation and sustainable development,” said Smith. Now that the three sanctuaries have been officially declared, Bangladesh officials will post signs so that local fishermen do not enter the protected areas. To achieve that goal, starting on Saturday, the Bangladesh Cetacean Diversity Project will bring a boat-based dolphin exhibition called the “Shushuk Mela” to local communities bordering the Sundarbans mangrove forest. Shushuk is the local word for the Ganges River dolphin. This month-long traveling exhibition is intended to raise awareness about the new wildlife sanctuaries and engage local fishermen and other community members in discussions on adaptive management practices needed to ensure human-dolphin coexistence. The new wildlife sanctuaries in the Sundarbans will provide protection for other threatened aquatic wildlife, including the river terrapin, masked finfoot, and small-clawed otter. 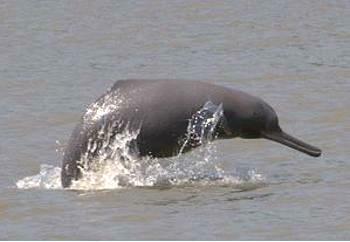 Bangladesh has been recognized as a critical place for freshwater dolphin survival. In April 2009, based on research by Smith and others, the Wildlife Conservation Society announced the discovery of the world’s largest population of nearly 6,000 Irrawaddy dolphins in the country. A portion of this population shares habitat with the endangered Ganges River dolphin, whose range extends all the way upstream to the shadow of the Himalayas in Nepal.